Teaching English to foreign students is one of the most rewarding jobs that you could ever have — and it’s a job that the Internet has changed greatly. In the past, you’d have to change your life significantly if you wanted to teach English as a second language. Finding a job would be only one of your worries — you’d also have to arrange transportation and lodging. You’d have to obtain a work visa. You’d also have to cope with living away from home for months at a time. Teaching English as a second language was certainly an adventure, but it wasn’t a job for everyone. Today, though, teaching English is an entirely different experience because you can do it from your own home. Teaching English online requires you to have certain qualifications, but prior experience as a teacher isn’t always a requirement. 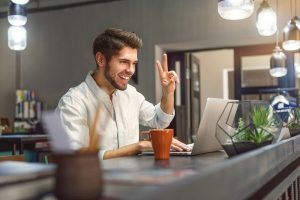 Unlike teaching English abroad, teaching English online also typically means that you’ll operate as an independent contractor rather than an employee. If you have the dedication to help young students realize their potential and the organizational skills to manage your own business, teaching English online is a rewarding job with flexible hours and a pay scale that’s often quite generous. Do you have what it takes to become an online English teacher? Read on to find out. Why Should I Consider an Online English Teaching Job? Online English teaching jobs are great for people who need the flexibility to set their own work hours. If you’re a graduate student or a stay-at-home mom — or you already have a primary job — you can’t take an online job that requires you to be available at the same time every day. When you teach English online, you choose when to make yourself available for lessons. If you have the time and need some extra money, you can log in. If you’re too busy with other responsibilities, you can skip a day. You are your own boss. Online English teaching pays very well compared to many online freelance jobs. If you work for a company that standardizes its pay, you’ll earn approximately $12-22 per hour. The pay scale may depend on factors such as your experience level, your adherence to a syllabus and ratings from your students. Other platforms may allow you to set your own rate. Ultimately, you can potentially earn the most money if you set your own rate. Some online English teachers charge up to $30 per hour. At first, though, you’ll compete against teachers charging as little as $5 for their services. It may be a while before you can charge the higher rates that you’d like to earn. What Are the Qualifications to Teach English Online? You must be a native English speaker living in a nation in which English is the first language. Some online schools advertise that their teachers speak with North American accents. In some cases, you may need to demonstrate that you live in the United States or Canada. You may need to have a bachelor’s degree. The subject of the degree typically doesn’t matter. You may need to have a teaching certification or prior teaching experience. Other online English teaching platforms aren’t really schools — they’re marketplaces in which teachers set their own rates, build their own curricula and advertise their services to prospective students. If you teach English online through this type of website, you may not need a degree — but you will probably still need to be a native English speaker. What Are the Primary Markets for Online English Teachers? Can you imagine a job in which you teach English online to Chinese students? Parents all over the world are looking for teachers to help their children learn English and give them the best possible start in their future careers. Asian nations such as China, Japan, South Korea and Vietnam are by far the largest markets for online English teachers, but you can also find some demand for English teaching in the Middle East and South America. Where Can I Find Online English Teaching Jobs? There are many potential avenues for finding online English teaching jobs. Although we discuss several opportunities below, the list isn’t exhaustive. You can find additional opportunities on job boards, forums about online employment, Craigslist or by simply searching Google. Some of the most popular job boards for teaching English online include TEFL.com, Dave’s ESL Cafe and ESL Jobs World. VIPKID: VIPKID’s primary market is China. VIPKID requires teachers to live in the United States or Canada and possess a bachelor’s degree in any field and one year of teaching experience. The pay ranges from $14-22 per hour for teaching English online to Chinese students. Lingoda: Lingoda offers English, German, French and Spanish classes to students throughout the world. Lingoda requires teachers to be native speakers of the languages they teach. The website does not discuss pay. Verbalplanet: Verbalplanet accepts students from anywhere and offers virtually every language. You’ll set your own price for lessons, and you’ll keep all of the money that you earn. Although the Verbalplanet website doesn’t mention specific qualifications for teachers, you will have to apply before you’ll gain access to the platform. Having a degree or prior teaching experience may increase your chance of acceptance. Open English: Open English primarily serves students in Latin America, so having the ability to speak Spanish or Portuguese may help with the acceptance of your application. Otherwise, the Open English website mentions no specific required qualifications. Teachers earn $8-11 per class. Learnlight: To teach for Learnlight, you’ll need two years of teaching experience and a certification in teaching English as a foreign language. If you’re proficient in a second language, it may help you get a position. The average pay at for teachers at Learnlight is $10-12 per hour. Englishunt: Englishunt primarily serves students in South Korea. To join, you’ll need a bachelor’s degree in any field and a teaching certification or substitute teaching certification. The average pay is $13-17 per hour. A computer with a stable broadband Internet connection. Any reasonably fast computer will do. A webcam. Although you don’t have to own the best webcam on the market, it’s a good idea to buy the best one that you can afford. If your students have no trouble seeing you and your teaching aids, you’re providing a better experience — and providing a great experience ensures that you’ll always have a steady stream of students. A headset. Since you’re teaching a language, your students will need the ability to hear you clearly. You’ll also need to hear them. Familiarity with communication applications such as Skype. Some online schools that provide online English teaching services also provide the software necessary to communicate with students. If a school doesn’t provide communication software, it’ll probably expect its teachers to use Skype. You may also need to purchase your own teaching aids to enhance the learning experience for your students. Many online English teachers use aids such as books, whiteboards and stuffed animals. Remember that although the school that hires you may provide a curriculum, you’ll still be an independent contractor. It’ll be your responsibility to create your own classroom environment. As a business owner, though, you can deduct reasonable and necessary expenses from your taxes. When you teach English through an online school, parents and students will choose you from a list of available teachers. When you’re new to the school, you’ll need to make yourself available as much as possible. The more time you spend on the list of available teachers, the more likely students will be to choose you. Once you’ve attracted as many students as you can handle, you won’t need to spend as much time waiting for work. When you’re new to the school, though, you’ll spend a lot of your time waiting for students to choose you for classes. Some online language teaching websites do not provide course materials to teachers or set specific pay rates. In this type of online learning environment, it’s up to you to construct your curriculum, tailor your material to the needs of your students and advertise your services in an effective way. The website merely provides the marketing necessary to attract new students and the online platform that enables you to conduct online classes. Have a head shot taken in a photography studio. A professional photo immediately sets you apart from the teachers who advertise their services using selfies. Log in to the platform as often as possible. An online learning platform will often tell students which teachers are available for immediate lessons. If the learning platform accepts feedback from students, consider working for less than your desired rate at first. You may have difficulty earning as much as you’d like if your profile doesn’t have a feedback score yet. Do everything that you can to differentiate yourself from other teachers. If you specialize in teaching certain types of students, have access to unique learning tools, have developed your own curriculum or speak other languages fluently, add that information to your profile. If you want to charge significantly more for lessons than your overseas competitors, your profile should clearly explain why you’re worth the extra money. If you teach English from home through an online school or a general learning platform, you won’t earn all of the revenue that your labor generates. A school or learning platform provides a teaching environment, marketing services and potentially a curriculum. teaching English through someone else’s website means that the website’s owner will receive a cut of your earnings. If you want to make online English teaching a more lucrative career, you’ll need to go into business for yourself. To launch an independent business as an online English teacher from home, you’ll need to set up a website. Your website serves as the destination for your online advertisements and gives prospective students and their parents an easy way to learn more about who you are and what you’re offering. Teaching independently may give you the ability to charge more for your services than what you’d receive for teaching English as a contractor. However, your website will need to demonstrate that you have the appropriate skill and experience to command a higher pay rate. Discuss the specifics of your curriculum on your website. Talk about the time you spent developing it and any awards that it has received. If you have previous online English teaching experience, solicit testimonials from students and their parents. If you speak other languages fluently, write website content in those languages. One of your goals is to attract the parents of young students. If the parents do not speak English, you may have trouble marketing to them successfully with English content. Advertise your website on search engines and social media. Target your advertisements geographically to reach the students you’d like to attract. Try to find a unique niche. You could target parents of very young children, or you could target parents of children with learning disabilities. You could advertise an accelerated English learning service to parents of gifted children. You could target adults who want to learn English to get ahead in business. Targeting a niche can help you differentiate yourself and capture more search engine traffic. Consider offering a single free session to each prospective student. Although you won’t earn money from offering free classes, doing so gives students and their parents a chance to see your teaching style before they commit to paying for classes. Teaching English to Chinese students through your own website may eventually blossom from a part-time job into a full-time career that keeps you happy for many years. However, your success will depend just as much on your marketing ability as it will your teaching skill. If you have prior experience as a teacher, you already know that making a difference in the lives of young students is a sure path to a level of job satisfaction that many people never achieve. Working online as an English teacher allows you to be a positive force in the lives of young people without living in a foreign country or even leaving home. Since teaching online gives you plenty of flexibility, it’s a great way to earn extra money if you’re a stay-at-home parent or already have a primary job. It’s important to remember, though, that online teachers rarely begin earning significant money immediately. Whether you work through an online school or forge your own path, it’ll take some time to build a steady list of regular students. I would love to teach students English. I taught my sons to read at 3 and 4 years of age using phonics. I can also teach just talking and explaining the English language and how to put words together and how to pronounce them.